The Piglet, food52’s annual tournament of cookbooks, is one of my very favorite things to read on the web, and I look forward to it with the fervor and fanaticism that most people reserve for their home town football team. The reviews cover 16 of the most notable cookbooks from the year, and they are pitted against each other in a bracket-style tournament. The winning book this year was selected because it was deemed to be the one that cooks would reach for most often in their day-to-day cooking, a metric I completely agree with. 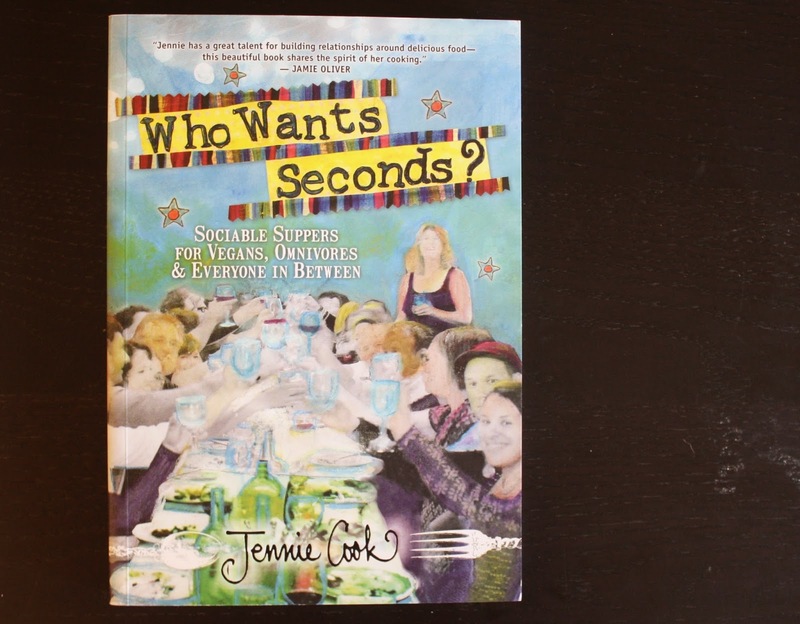 But if that’s the case, then Jennie Cook’s new cookbook, Who Wants Seconds?, may very well have won my personal vote for cookbook of the year. My delightful sister Helen worked for Jennie at her much loved restaurant in Culver City, the Double Dutch Dinette, where she said everyone was a regular. It was the type of place where if you wanted to learn how to cook, they would teach you. Jennie encouraged everyone to cook and made everyone feel like an important member of the team. All of her employees were viewed as artists and creative people and if someone had a good idea she would use it. Art on the walls was from the waiter or the chef’s girlfriend. If you were good at writing you worked on the website. If you had an idea for food or the menu, even if you weren’t a chef, your idea was taken seriously. Helen, in a bad mood one day, made herself an ice cream sundae, which ended up being a feature of every Sunday dinner service. Helen describes her time there as the absolute best place to learn and grow. This love of teaching and creativity is infused through Jennie’s beautiful cookbook. She has picked up recipes and techniques through the people she has met and worked with, and the end result is a cookbook that blends the classic comfort food she grew up eating with more modern and global flavors, sprinkled with great tips for hosting parties and planning meals from the queen of LA catering. Wonderful, right? I love the familiarity, the nostalgia, and the casual tone of Jennie’s writing. The bean recipe itself is simple and delicious. (I’ve copied it at the bottom of this post). 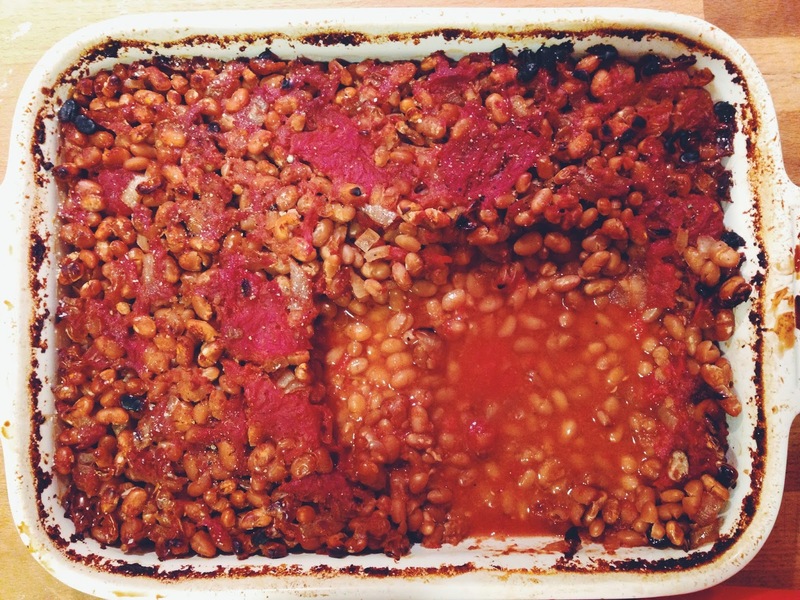 I used canned whole tomatoes squished up a bit with my fingers instead of tomato sauce and really liked it that way, because the larger chunks of tomato got sweet and roasty and it really reminded me of a full english breakfast. One important note about this recipe and the other bean recipes in this cookbook though. Jennie recommends not salting the beans before cooking, which she says makes them tough, and her recipes also include a bit of vinegar in the cooking water, a vegan old wives tale of sorts about making the beans easier to digest. I recommend you do just the opposite. ALWAYS salt beans while cooking (this won’t make them tough but will make them taste better- see why here and here), and never add an acid like vinegar or tomatoes to beans before they’re cooked- this is what causes beans to seize up and stay too firm. The best way to make beans easier to digest is to eat more beans. Your body gets used to it and you won’t be plagued by GI issues. 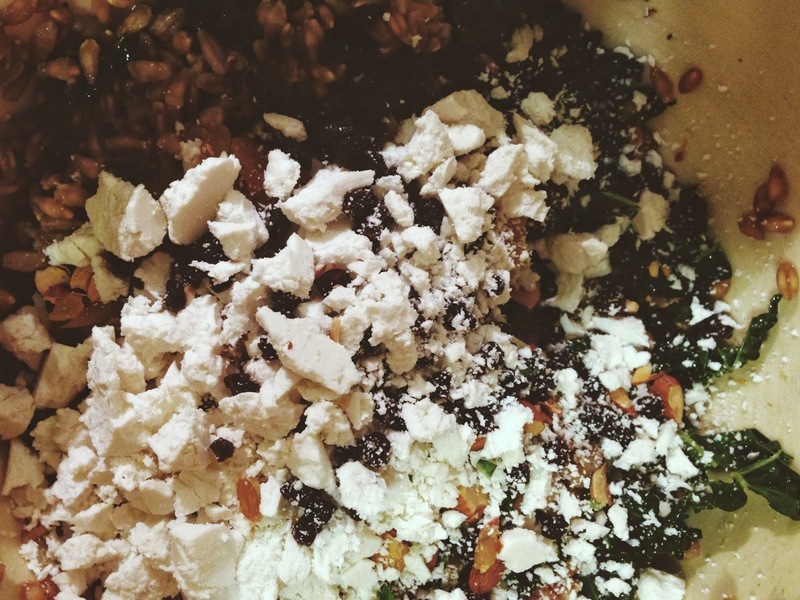 Farro al Fresco – this is a wonderful formula for making any grain salad, which includes something green, some nuts, dried fruit, crumbled chevre, and a simple vinaigrette. 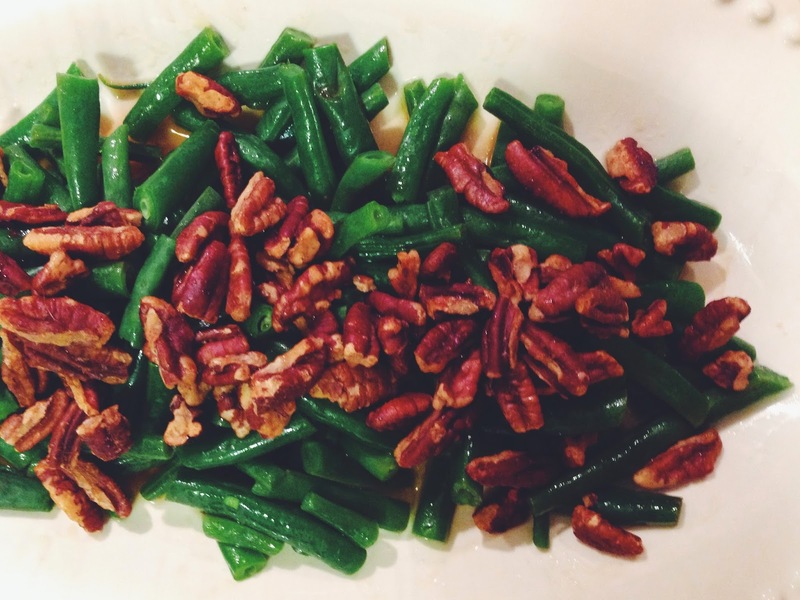 Green Beans with Chile Pecans and Sesame Dressing were light and satisfying. I’m not a huge fan of green beans, but the sesame oil plus chile pecans made them much more palatable! 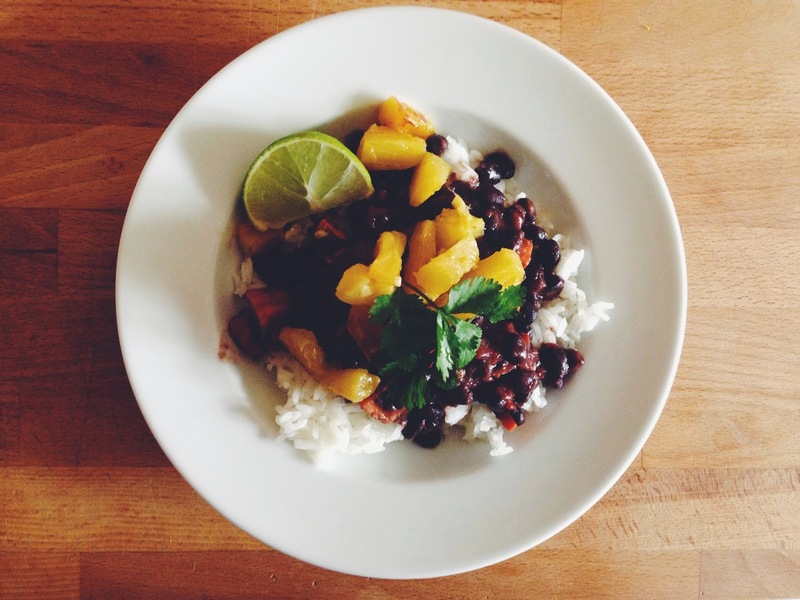 Feijoada, a Brazilian black bean and sweet potato stew was a delight. Jennie’s recipe is vegan and served with a delicious pineapple relish. As with the the baked bean recipe above, I’d recommend that you omit the vinegar from the cooking water and add plenty of salt instead. This is a great party recipe (it makes a ton! ), and is naturally gluten free and vegan too. Cumin Scented Turkey Meatloaf with Creamy Gravy and the Amazing Corn Sensation. This turkey meatloaf is easily worth the price of the cookbook- it is my new go-to meatloaf and absolutely perfect. Most meatloaf recipes call for 3 different meats (pork, veal, and beef) to get the texture and flavor right. 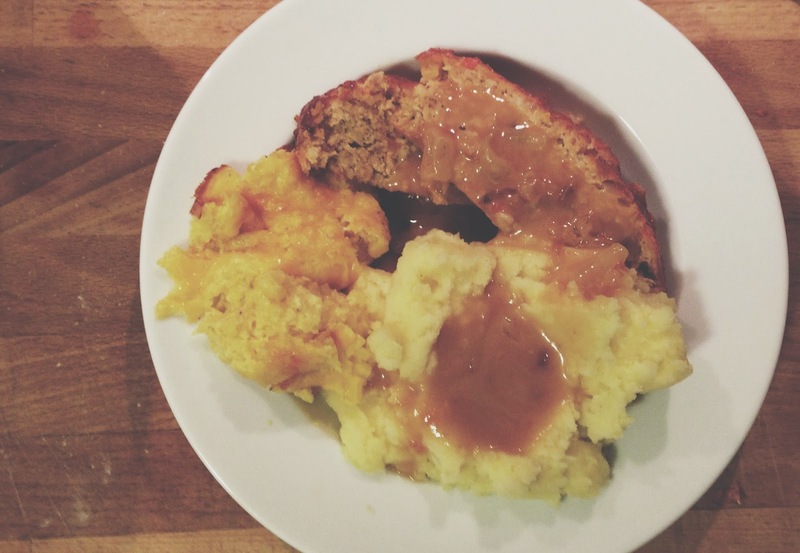 Jennie manages to make the most sublimely-textured meatloaf using just ground poultry and a few tricks. I used ground chicken because it was readily available at my farmer’s market and it was still fabulous. Jennie calls for 3/4 cup of quick oats to be mixed in, which she says “create an almost creamy center.” It’s true! And I didn’t have quick oats, only the thick old-fashioned rolled oats, and they still disappeared into the meatloaf and made it creamy and delicious. The cumin really adds a delicious note too. I can’t say enough good stuff about this meatloaf. Get the book and try it! The creamy gravy and amazing corn sensation were both lovely and perfect accompaniments to the meatloaf, but they definitely played second fiddle in my book! Jennie’s book is filled with tons of appealing recipes, and the recipes themselves are very thoughtfully written and just the sort of thing I like to cook on a weeknight. A lovely book written by a lovely person. adapted slightly from Who Wants Seconds? Preheat the oven to 350 degrees. In a large stockpot, cover the beans with water by 2 or 3 inches, add thyme, bay leaves, and enough kosher salt to make the water taste like the sea, and bring the beans to a boil over high heat. Reduce heat and simmer until beans are soft, about 1 hour. Meanwhile, combine onion, sugar, tomato sauce, and mustard in medium bowl. When beans are soft, drain the cooking water, remove bay leaves and thyme stems, and stir beans into sauce mixture. Pour into greased 4-quart glass, ceramic, or stainless pan and bake, covered, for 3 hours. Check and add more water, one cup at a time, as necessary, keeping it saucy but not watery. Uncover and continue cooking until beans are caramelized on top, 30-55 minutes. Taste and add salt and pepper if needed. Variation: Grammy added a pound of chopped raw bacon to the pot, and I’d certainly understand if you chose to do the same. What a delightful book! I hope you get a chance to read and cook from it!